SLT Rainbow Pages the national directory information services provider has released its latest SLT Rainbow Pages Directory for 2012, containing commercial and socially valuable information under 1,300+ categories , with nearly 20,000 listings. 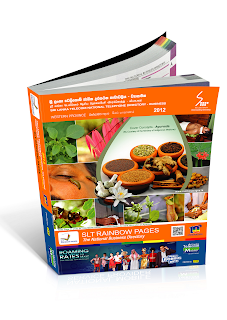 This SLT Rainbow Pages Directory is a treasure trove of practical and useful information that is distributed free to SLT customers in the Western Province. The SLT RAINBOW PAGES directory is the only classified directory publication in the country that makes SLT the only service provider to provides a comprehensive directory service to anyone. The SLT Rainbow Pages Directory is free to all SLT residential & business customers in the Western Province. All a residential SLT customer needs to do to collect a copy of the directory is to visit any of the 34 Teleshops or RTO (Regional Telecom Office) network in the Western Province. In order to benefit non SLT customers, SLT has made the directory accessible online at www.rainbowpages.lk.The website is proving to be very popular and attracts visitors from many countries around the globe, who can browse for products and services of their choice. The SLT Rainbow Pages Directory information can be accessed from the Call Centre on 1231, or by calling 444 on Mobitel, Dialog or Etisalat number, 4636 on Hutch number, on Directory CD, Peo TV or on Mobile WEB (www.rainbowpages.mobi) By offering such wide accessibility, SLT Rainbow Pages is moving closer to its vision of becoming the customer’s number 1 choice for information.